- I cannot overemphasize the need to watch for icy patches, black or otherwise. We received a lot of rain earlier in the week. The temperature was in the low 20s when we started Thursday morning, so we encountered ice in several places. Some extended fully across the road. It is supposed to warm slightly by the weekend, but that's no guarantee that all of the icy spots will thaw. - While this route is well-known to many, it still requires attention to the cue. There are so many roads criss-crossing all over in Lancaster County that it is very easy to find yourself off course. The cue is top-notch. - It is a LONG way from Controle 2 to Controle 3, not just because of the mileage. A couple of interim oases have been noted on the cue sheet should you need them. Watch your time. - You cannot have too much lighting. You will discover this on your way to the finish, especially if you don't have enough. I plan to have breakfast at the diner at 7am and will handle sign-in from there. I'll be in the parking lot afterwards for bike/equipment checks. The cuesheet has been updated to draft 11 dated 12/30, with changes from the volunteer preride. If the current weather forecast holds, temperatures will range from the mid 30F's to 50F's -- the low temperature for Sunday will be around the high temperature we had for Thursday's volunteer preride, which included unexpected snow flurries for much of the day. It also looks like a rather stiff south west wind is in the forecast -- this will make the 45 mile leg from controle 2 to 3 rather difficult. You'll want to bank some time on the way to controle 2, and keep your stop there very short... and finding a friendly wheel to draft behind would be even better. In addition to the many cautions highlighted on the cuesheet, you should watch out for icy patches. In particular, underpasses and run-offs from driveways and farms present a hazard in several spots along the course. Also, there is some precipitation in the forecast for the evening, and you will be descending the colder, north face of some climbs towards the end of the course. Organizers, Andrew Mead will be at the start to send you on your way, and Bill Olsen will greet you at the finish. If you arrive at the finish before Bill does, there will be a sign-in sheet at the cashier where you should record your time. The cashier will sign your card and hold it until Bill arrives. Reminder: be sure to park your car in the Rita's lot, away from the diner. And as always, be sure to check back on the website/message board for any last minute updates. What better way to kick off a new year of randonneuring than by bagging an ACP 200k? The 4th annual PA Dutch 200k brevet will be held on January 1, 2012 (yes, folks, that's SUNDAY) to start the 2012 Pennsylvania Randonneurs R-12 series. We will be riding the route that Rick Carpenter championed, but without Rick since he has now relocated to coastal North Carolina. Unfortunately that also means we'll be missing out on the fine hospitality of Rick and Lora Beth that has made this event so popular in the past. We will miss Rex greatly and wish him and Lora Beth the very best. Since the Carpenter's house on the hill is no longer available for brevet duty, the start location has be moved to the Mt. Penn Family Restaurant. This may be good news for many as that final 500ft climb to Queens Court is no longer required to finish. Recognizing that many randonneurs may also be ringing in the new year, the starting time has been pushed back until 8:00am. This also allows participants to enjoy breakfast at the start since the Mt. Penn Family Restaurant doesn't open until 7:00am on Sundays. Registration details are posted on the PA Randonneurs website. A course pre-ride is scheduled for Thursday so check back on Friday for any last-minute updates to the cue sheet. One final note: lights and reflective gear are MANDATORY for this ride. · Two dozen or so Eastern PA participants made it to the starting line at PBP. While I was pulling for each and every one of you, it was especially gratifying for me to see the following riders have a successful ride: Yiping Lin from Taiwan completed her first U.S.A. brevet with PA Randonneurs; Ron and Barbara Anderson rode their very first event with PA Randonneurs in 2006 (the very first year of Eastern PA events); Christine Newman, with the confidence of an EM1000k and Eastern PA SR series under her belt, found redemption in 2011 after coming up a bit short in 2007. Eric Keller, Chris Nadovich, Joel Flood, Roy Yates, and Cecilie Adams also rode their first brevets with PA Randonneurs; And Cecilie, as many of you already know, became engaged to Patrick Gaffney at the top of Fox Gap back in 2010 – all went according to plan, with their marriage just before PBP and a post-ride honeymoon in France. · There were a record number of Eastern PA Super Randonneurs: Cecilie Adams (2), Shane Beake, Gavin Biebuyck, Rick Carpenter (3), Tim Conway, Joe Fillip, Bill Fischer, Joel Flood, Patrick Gaffney (2), Doug Haluza, Guy Harris (3), Mark Kaufman, Eric Keller (3), Chris Nadovich, Christine Newman, Bill Olsen (3), and Roy Yates. Well Done! 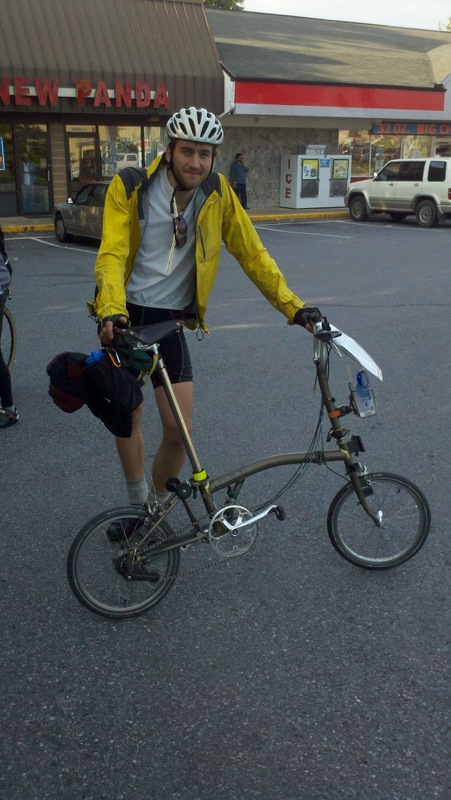 · Bill Olsen clipped-in and finished 4060 km of the 4760 km on the Eastern PA calendar, missing only three opportunities to ride – most likely because he was instead riding a 1200k somewhere else! Bill also notched another PA R-12 series. · Several other riders also completed their R-12 series. Of note, Doug Haluza completed an R-12, despite having a number of spectacular mechanicals to deal with on a couple of the rides. Don Jagel joined the Eastern PA honor roll by completing an Eastern PA R-12 this year. Rick Carpenter completed yet another R-12 series and is closing in on an R-12 streak of 5 years – Wow! In 2012, there will be several domestic 1200k's to choose from. The Eastern PA region will be offering many brevets for qualification and preparation including a complete SR series and an R-12 series of monthly 200k’s. And for those of you who are freshly minted PBP anciens, you just need a Fleche and 1000k to earn the prestigious R-5000 award – and the Eastern PA region will give you an opportunity to do so next year. But in order to keep running all these events, we need some new volunteers to step up and take their turn at the front (and perhaps allow some of the regular volunteers to sit-in for a while). In years past we have done an article in the American Randonneur congratulating all the K-Hounds past and present. This year I’d like to share a spread sheet that shows just how impressive this effort has amounted to (see randon listserv for spreadsheet). A grand total of over 1,417,354 Km's - of individual efforts of more than 10,000 Km's per year within 6 years. No other country in the world comes anywhere close to this accomplishment. In the past 6 years 54 RUSA members have earned 107 K-Hound Awards for riding more than 10,000 Km in a calendar year, with female RUSA members being responsible for about 30% of these K-Hound Awards. Although 2011 is not official yet, it will be the biggest pack of hounds ever, with 34 RUSA members earning K-Hound Status. Congrats to our new 2011 K-Hound Klub members; Ward Beebe, Grover Everett, Stephen Hazelton, Ken Johnson, Spencer Klaassen, Joe Kratovil, Tim Lucas, Maile Neel, Ogden Olmstead, Bill Olsen, John Pogue, Susan Pogue, Bryan Rierson, Bob Riggs, Thomas Russell, and Catherine Shenk. Congrats again to all for making RUSA such great group of over achievers to run with. Given the heavy rain earlier in the week, and another batch in the forecast in the next day or so, we managed to find another perfect December day for a bike ride: it was a crystal clear day, with temperatures starting out around 29F in the morning, and warming up to around 50F by the afternoon. With a high pressure system parked directly on top of the course all day, the winds were thankfully calm. Streams and river were flush from the abundance of rain we've had, with a few frozen seeps along the road early on. 18 of the 20 riders who clipped in at the start made it to the finish. New participants, Cynthia Hearing and AJ Stachelek are both triatheletes from NYC. AJ decided to call it quits at Portland, due to numb toes. Cynthia, despite a 30 minute late start, managed to make up the lost time and just keep ahead of the controle closing time by a handful of minutes. But as she ran out of daylight, she lost her battle against the clock on the Tunnel Rd climb. Although AJ and Cynthia came up a bit short this time, they promised me they'll both be back again next year. Special thanks to volunteer Keith Spangler for manning the controle at Lafayette and sweeping the course to Great Meadows. Not only was it great to have a familiar face greet us at the half way point, it was also reassuring to know Keith was there to make sure everybody made it safely through and was there to handle any unforeseen problems. As the name and construction suggests, it's meant to be ridden on the beach - specifically, somewhere down in North Carolina where Rick is in the process of moving to. I'm pretty sure that this beast weighs somewhere north of 40 lbs. And despite all of it's heft, it doesn't even descend very well, due to the 4-inch knobby tires. Compounding the difficulty factor with this rig, the gears in the internal hub started slipping on the climbs. Along with this most unusual setup, Rick had a most unusual wild-life close encounter while riding down the road: a small bird smashed squarely into his face. Immediately after the small bird impact, Rick was then slashed by the talon of an accip raptor, who was in pursuit of the panicked bird -- Amazing! Of note, Doug Haluza completed his R-12 series -- this one, was uneventful with none of the mechanical problems he's had on a couple of the rides this past year. Ron and Barbara Anderson completed their third R-12 series in a row for a streak of 36 months. And speaking of streaks, Rick Carpenter has one of fifty-something, and closing in on 5 years of riding at least a 200k or longer each month and Bill Olsen has a streak of 14 months going with Eastern PA finishes. Bill writes: "...thanks for another great event. It was nice to experience last month's ride in reverse as some climbs are better this direction rather than the other (and some are worse in this direction) giving one a totally different ride. Although I like the Retour start out of Portland, and the return home up through Belvidere in the dark, the change of start to Milford was a nice variation and the climb up Tunnel Road wasn't half bad, knowing that once I made it to the top, it was pretty much down hill all the way back home..."
Also of note, Jon Clamp and Guy Harris made it around the course in good time on their fixed-gear bikes. Remarkably, Jon finished under 9 hours and within minutes of first finisher Geoff Brunner. Guy writes: "...Thanks for another great event. Milford is a great start/finish - don't know how I resisted a trip to the Ship Inn. Very sun friendly direction to run this course, morning sun along the Delaware and a nice decent into the sunset..." Jon writes: "...Many thanks this year for stringing together a host of impeccable courses and cue sheets. Also to all the volunteers for their help in facilitating our sport. It appears seemless but undoubtedly requires alot of time and effort behind the scenes. Saturdays ride was a little brisk and I think everybody must have felt like they had blocks of ice at the end of their legs. I did for one. I rode fixed until the Quick Check control and realizing that we had some steep climbs and a few good descents coming up I decided to "flip" my rear wheel as it offered a lower gear and the ability to freewheel. I also had the benefit of being able to draft Don, Bill and Matt on the downhill sections as I cannot pedal that fast. I think we were all surprised at our time! ..."
Len Zawodniak writes: "...The ReTour was ReWarding! Decidedly cool at the start, bur warming up nicely during the day, a great collection of riders, and good choices for controls. It was really nice to have a volunteer at the lunch stop, Thanks !..." Nigel Greene writes: "...Another memorable event by the PA Randonneurs. I really enjoyed the course and look forward to riding the opposite direction the next time its offered. The cue sheet was spot on and the controles were well spaced. .... As you know, this was my first year riding with Pa Randonneurs and I have to say I really found it memorable and enjoyable. Thanks for everything. I Look forward to next year's challenges ..."
This wraps up the Eastern PA 2011 calender of events -- for me, it was a satisfying conclusion to a great year of brevets. In the coming weeks, I'll be sending out the year-end mailing with your validated brevet cards, reflections on the past year, and the 2012 calender of events. The first event of the new year, will be on New Year's Day. As you look ahead to the new year, I'd be interested to hear what your cycling goals are. -Mile 70.9: as noted on the cuesheet, there is a very large gap between the road and the shoulder, as you descend down to a small bridge over a creek. This crack is wide enough to swallow your wheel and ruin your day. -Mile 71.5: as noted on the cuesheet, the driveway entrance to the QuickChek controle is raised above the roadway. You'll be riding along Rt 15 as you turn into the controle -- since this is a busy highway, you'll be riding close to the shoulder, so you'll have a bad angle over the bump as you turn into the driveway. Please take extra caution here or better yet, dismount before the driveway. When you are ready to leave the controle, use the exit in the rear, which will avoid the busy intersection at the traffic light. The December R-12 is on Saturday, December 3rd. We'll be running the same course as the November R-12 in the reverse direction: Le Retour du Stillwater 200k. The start/finish has been moved to Milford, NJ -- the southern most extent of the course. There is plenty of parking in the large parking lot on Church St in Milford. The start controle will be at the Milford Station Bakery, which opens at 6AM and has breakfast sandwichs along with an assortment of baked goods. The finish controle and post ride gathering will be at Pipolo's Pizzera, a couple of stores down the street from the Bakery. I've already heard from a couple of riders planning to clip-in. If you're planning to join us too, please send me a note. As we approach the end of another rando-year, please remember to check the status of your RUSA and PA Randonneurs memberships and renew, if necessary. Please direct any comments on the experience to membership@rusa.org. Renewing your PA Randonneurs membership is still best accomplished by mailing a check to Tom. You can save a stamp by hand-delivering your renewal at the next R12 brevet on December 3. It was a crystal clear day, with temperatures starting out around 29F in the morning, and warming up to the low 50F's by the afternoon. Despite the recent storms, some fall foliage was still intact along parts of the course. And speaking of storms, there was still a number of areas without power, as evidenced by the drone of the portable power generators. All 16 riders who clipped in at the start made it to the finish well before the cut-off, for another 100% finish rate -- congratulations to everyone for an excellent result. Special thanks to volunteer Bill Olsen for manning the finish controle and making sure everybody got in safely. Of note, first-time Eastern PA participant Ted Smith came all the way from New Haven, Connecticut to join us. Ted writes: "... I thoroughly enjoyed the route. There were lots of hills but that goes with the territory... Kudos on the cue sheet as well. The accuracy was perfect. I especially found that the notes/descriptors of turns were very helpful...I enjoyed riding with the Andersons and everyone else in the back group. I will definitely keep an eye on your upcoming rides..."
Also of note, Mark Kaufman completed another R-12 series. Remarkably, Mark has a streak of 24 consecutive months, going all the way back to his very first brevet (which happened to be one of our "epic" December events with an unexpected snowfall). First finishers, Norman Smeal, Don Jagel, and Andrew Mead made it around the course in 9:40. Norman writes: "...Another perfect day for a great ride. Andrew and Don, thank you for letting me tag along. See you in December, hope everyone does the nice weather dance, again..." Don Jagel writes: "...Thanks for putting together the Stillwater 200K yesterday. The weather was perfect for an early November ride. I really enjoy this route, with a good combination of cruising and views, particularly the view of the Water Gap near the finish of the ride. You just can't get that view with the leaves on the trees. Norm, Andrew, and myself rode together for the entire ride, with Norm being the strong man of the day. He would pull us along on the flats, gap us on the up grades, and drop us on the climbs. Aside from the beautiful scenery, we did see a few surprises, including active construction (on a Saturday!) at the bridge along Cemetery Road, a tractor trailer accident in the process of cleaned up along Route 80, and several areas that were still without power one week after the October snow storm. With regards to the pothole close to the truck stop near the end of the ride; it was everything you had described, and we all gave it a wide berth. I am definitely looking forward to doing this route in reverse in December, and hope we have similar weather. The amount of time and care you put into developing and executing the monthly brevets is very much appreciated. ...Thanks again for a great day..." Andrew Mead writes: "....Yesterday's brevet ranks near the top of my memorable rides. Couldn't have asked for much better weather. It has been a while since I spent most of a brevet with company. Don & Norm were excellent companions and kept me motivated all day. We had a great time. The route was in good shape given the weather of the past month; the cue, as usual, was even better. "Cyclocross" came to mind as I picked my way through the bridge construction coming into Great Meadows. Add in the personal controle service in Milford and the finish and you have one wonderful ride. Thanks!..." Older entries in his blog describe his long road to recovery from his accident last year. the embankment. There were also a number of oil clean up trucks on the scene, suggesting that the big rig had spilled some fuel. It was quite a scene. We were able to walk through after waiting a bit for the back hoes to take a pause in their clean up work....Thanks again, Tom. Really great job ..."
Next up is the final event for the 2011: the December R-12 in four weeks. We'll be running the Stillwater 200k again, but this time in the reverse direction. In addition to a few route tweaks, the start/finish controle will be moved to either Milford or Belvidere -- this will avoid having to ride the River Road stretch in the dark. Hopefully, our streak of good weather will continue. The course was checked out with a volunteer preride that I completed on Tuesday, 11/1. As you can imagine, most of the area was still in recovery mode from the weekend snowstorm. Although this effort is clearly still a work-in-progress as evidenced by the many road crews I saw working, the course was in better shape than I expected -- especially in light of the wide spread destruction that the storm caused. That being said, I'd estimate that more than half of the area that the course passes through was sill without power, given the constant drone of portable power generators I heard throughout the day. -In general, there is a fair amount of grit and loose gravel on the road, due to the sand and salt treatment from the recent snow storm. Please take extra care in cornering. -There may still be some low-hanging branches and debris protruding into the roadway. -Mile 27.1: After crossing Rt 173, the road changes name to Maple Ave.
-Mile 39: I saw a live wire that had fallen and was arcing to the wet ground with an impressive light show. It's likely that this will be repaired by the weekend, but keep in mind that any wires you may encounter on the road may be lethal. -Mile 47.0: There was a "Road Closed" sign and some road debris further on down the road. But the road was passable, and it's very likely the road crews will have taken care of this issue by Saturday. -Mile 48.6 to 51.1 (Tunnel Rd): This area was hit pretty hard, and several road crews were busy clearing debris and repairing the power lines. Although I encountered a few temporary road closures, I was able to pass through OK. It's seems likely that most of this repair work will be completed by the weekend. -Mile 56.9: There was a "Road Closed" sign and further down the road, a fallen tree had blocked one lane. However, I was able to pass through OK, and several cars also seemed to be ignoring this sign as well. -Mile 64.8: Road is unmarked. -Mile 70: There is a "Road Closed" sign and some bridge construction. However, the bridge is passable, but you will have to dismount and walk around some heavy equipment. There is also a short stretch of dirt road around the construction. This of course was a bit muddy from the recent snow melt. But it will most likely dry out by the weekend. -Controle #3 (Mile 71.6): The power was still out in this area and the store was closed due to the outage. Even if power is restored by the weekend, the store may not be fully restocked. You should replenish your supplies at the Milford controle #2 with enough to go beyond controle #3. There are some stores off-course (as indicated on the cuesheet) near mile 78.8 in Allamuchy. This area had just gotten power restored, about 5 minutes before I arrived. The deli owner met me outside -- he had tears of joy at getting his power back. But alas, he had nothing to offer in his store, other than warm drinks and chips...the rest of his inventory was ruined. Further down the road in Tranquility, there is a deli at mile 82.1 on the left. This store never lost power, and would certainly appreciate having a few hungry randonneurs stopping by. -Mile 88.2: There is a bike repair shop, if you need one. -Mile 104: There is a short stretch of 1-lane roadway, under control of a traffic light. This appears to be due to be some damage compliments of tropical storm Irene. You should wait for the light to turn green, and let any waiting cars there to go on through first. The one-lane restriction is about 0.1 of a mile. -Mile 119.9: This is unmarked -- there is a baseball field at the turn, which you can use as an additional "spotting" cue. -Mile 125.2: (Rt 80 access road) There is a huge crater of a pothole, right in the middle of shoulder. This will most definitely swallow your wheel up whole and ruin your day if you hit it. Please keep an eye out for this hazard, especially if you're passing through after sundown. -Mile 126.6: The cue is correct, but the road sign has been rotated 90 degrees, so the signage is a bit misleading. -Mile 127.1: The cue is correct, but the exit is for "Portland / Rt 611" (the cuesheet has "Portland /River Rd"). For the November R-12, we'll be running the Stillwater 200k, and hopefully, the recent snow will be melted by then and perhaps, a bit of fall foliage will still be around. With the closing of the Portland Diner, the start location will be the Portland Park and Ride. There is another diner about a half mile away in Mount Bethel, where we can top off for breakfast before the ride -- I'll be there around 6AM if you want to join me for breakfast and collect your brevet card. The finish is at Teresa's Pizza, about one half mile from the Park and Ride start: after signing-in at the finish there, you can coast all the way downhill from there to the Park and Ride and your car. A volunteer preride is planned for this Tuesday ... be sure to check the PA message board and website for any updates. Also, with the limited daylight, lights and reflective gear will be required. If you'd like to join the the roster, please send me an e-mail by Thursday. Mile 9.5: SS at bottom of hill. Blind curve left. Mile 12.5: Caution pine needles on sharp turn on descent at Cascade Lodge. Mile 75.7: (not unmarked). River road goes right. In general, beware of fallen leaves and pine needles, especially if wet. Also watch out for sharp dropoffs at the edge of the pavement where rainwater runoff has eroded the shoulder.."
The next event is on October 22 and you have a choice of either a 150k or 200k course. The start/finish will be at the Weisel hostel, with breakfast served 1 hour before the start We'll also have the traditional post-ride BBQ, where we can recap the accomplishments of the past year and look forward to the challenges of the coming year. With only about 10.5 hours of daylight available, lights and reflective gear will be required, unless you have previously finished the course in less than 9.5 hours. There are 2 bridges under construction and not passable. Unfortunately, one of those bridges is on Sweet Hollow Rd, one of my top 10 favorite roads -- there was a road crew ripping up the deck as I passed on through during a recent scouting trip (probably as the last cyclist to do so for the foreseeable future). The other bridge out is on Headquarters Rd. There's actually a third bridge out, also on Headquarters Rd, but that one is still passable. I keep hearing talk about stimulus spending for our nation's crumbling infrastructure but see little evidence of any real progress with our roads and bridges! ... please let me know of any corrections or other issues. Results will be sent to RUSA shortly, and then become final, pending ACP approval. Once again, there couldn't be too many complaints about the weather -- while it's been a very "Hazy, Hot, and Humid" all summer, we just got the "Humid" for Saturday's ride. Overcast skies kept the Hazy and Hot at bay, although the sun did poke through the clouds a couple of times. Some riders saw a couple of little rain spritz's at the end, but everybody made it in to the finish before the heavy rain moved in. Eldred after relaxing for awhile at the control. However, the descent that followed certainly made it worthwhile. I hope everyone made it back before the rain started. I got a good soaking while riding home..."
Roy Yates writes "...yesterday was a perfect day for a perfect ride. Also, the modified route through Eldred with smooth roads, not too much traffic and a plethora of truck-on-cheese signs was very agreeable..."
recommended by the group in just ahead of me and hit the spot. Thanks to Bill for organizing and pre-riding the new route...."
Norman Smeal writes: "...Great day for a great ride. Thank you Bill for putting on the show..."
Bob Dye writes: "...A great big thank you to you and Bill for a wonderful day in the saddle! Not only is the course beautiful but you guys did a great job on the weather, too. The cycling gods were smiling on me today and I don't believe I've ever had a more enjoyable ride. BTW, I'm not so sure I believe Bill regarding the new extension around Eldred being no more difficult than the old route. I did like the change however. Thanks again and I can't wait to do it again..."
Geoff Brunner writes: "....Thanks for a great day! The route was wonderful. I would concur with others on the side trip to Eldred as it was an accommodating controle and a nice break from 97 - personally, I'll take hills over traffic any day. The route was overall very well thought out, and made for an enjoyable time with certainly some significant challenges! I particularly enjoyed the company of all of the riders in the group with whom I had the pleasure of riding with at various stages....Thanks again to you and Bill and the others who were involved in organizing the event. I'll look forward to the Hawk Mtn ride next month!...." Special thanks to Bill Olsen for a superb job of organizing the ride. In addition to preriding the revised route, he swept the course in his car, making sure everybody was safely accounted for. Thanks also, to volunteers Bill Blank and George Metzler for joining Bill on the volunteer preride. ... this is an absolutely fantastic route that organizer Andrew Mead has put together. We'll be headed back to Hawk's Nest for the August 13th R-12 event. But this edition has some extensive route changes to avoid some deteriorating roads and some of the heavy traffic on Rt 97. Organizer Bill Olsen, along with volunteers George Metzler and Bill Blank, completed a preride of the revised course last weekend, and Bill's preride report below highlights the changes for you. ... Thanks John for your good insights, and on behalf of all the PA Randonneurs, we'll be pulling for you to have a complete recovery. ... if you'd like to join the roster, please drop me a note. George Metzler, Bill Blank and I completed a pre-ride of the revised Hawks Nest route on Saturday, 8/6. The humidity was near saturation for most of the ride but fortunately the temperatures held off until early afternoon when we were able to reach the shaded sections of Old Mine Road. George and Bill made it in before the rain but I found that the humidity gradually increased until it reached oversaturation and I was rewarded with a cooling drizzle for the last couple of miles into Water Gap. Although you'll still pass the River Market in Barryville, you need not worry about stopping for refreshments as The Corner controle 5 miles up the road in Eldred has a good selection of ice cream and beverages that will get you through to either Muller's Port Jervis Diner or the Layton Country Store. For those of you that didn't ride with us on July 30th, the Layton Country Store is under new management and in addition to having a better hours, a wider selection of items from the grill, the burgers and tuna subs will definitely fill you up! - The 4-mile stretch of fresh chip seal starting at Canedesis that was being laid down when Tom rode the pre-ride on the 27th has been fully cleaned up. They must have used a roller on one of the warm days last week as the exposed stones that we experienced on the 30th have been smoothed into the pavement so that the resulting surface is just a "normal" chip and seal. They've also repainted the lines along the road and demarcated the shoulder for that section. - The new route on Rt. 507 (Lake Wallenpaupack Road) has a couple of areas where the previous winter frost heaves have not yet been repaired. We're only on this road for a mile an a half and it isn't a problem if traffic is light but if you're riding in a group, you might want to give some additional spacing. - At Hawk's Nest, road construction continues that has the road closed to a single lane with a temporary traffic light. The single lane is rather long and the light is a bit on the short side. But you'll have a enough time to clear the construction if you wait for the light to turn from red to green. I found that even when I waited to let all of the cars that were line pass me go ahead (so they didn't have to maneuver around me) I had plenty of time to make it though the construction and well out beyond the waiting line of oncoming traffic before the light changed. The Water Gap Diner will be opening at 6AM if you'd like to top off with a good breakfast before the start. I've let them know to expect us.